Drummer and aspiring audio engineer, Nacor Zuluaga was planning on taking audio classes at community college in Queens, New York when he learned about Recording Connection’s in-studio approach for training in audio engineering and music production. Although everything was already setup, including financial aid, Nacor called the community college and cancelled everything and decided to just give the RC program a chance. 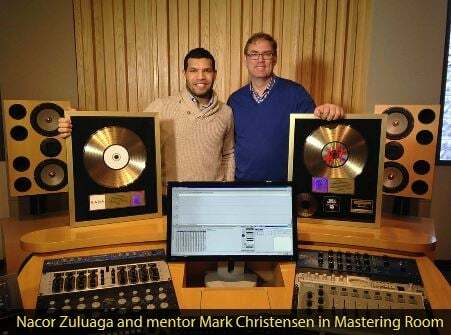 But when Nacor went into start his apprenticeship with studio owner Mark Christensen at the world-renowned Engine Room Audio in NYC, he saw there was a challenge he’d have to face. Having moved to the United States from Colombia, Nacor felt he would only be able to make the most of the opportunity of getting in and training at Engine Room if he improved his fluency in English first. Nacor Zuluaga stayed on at Engine Room for two years during which time he completed work on the jazz pop album and then went on to accumulate a long list of credits and receive seven gold awards as Mark Christensen’s assistant on tracks for Trey Songz, Platinum-selling Italian rapper FedEz, and German electronic DJ Robin Schulz (Mr. Probz) just to name a few. Now, Nacor speaks English effortlessly and with a distinctive NYC flair. He’s still recording at Engine Room but has moved on from assisting Mark to working with his own clients. He’s deeply appreciative of the time Mark put in to helping him build a career in audio. As an apprentice and assistant, Nacor has also built a great relationship with the studio, something he says should not be underestimated by any newcomer. Well said Nacor Zuluaga! Here’s to making the most of the challenges ahead! Nacor mastered and plays drums for Pool Cosby!